Michaelia Cash: Bill Shorten staff subject of "rumours". Michaelia Cash threatens to name "every young woman in Bill Shorten's office" she's heard rumours about. 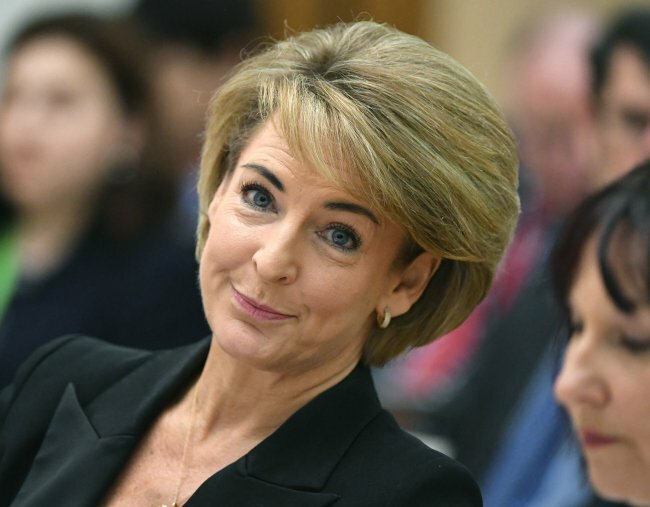 Cabinet minister Michaelia Cash has withdrawn a threat to make public “rumours” involving female staffers in Bill Shorten’s office after Labor pressured her over the “disgraceful” outburst. The extraordinary threat was made after Labor frontbencher Doug Cameron asked Senator Cash if her newly appointed chief-of-staff, who is yet to start work, was formerly employed in another Liberal office. “If you want to start discussing staff matters be very, very careful because I’m happy to sit here and name every young woman in Mr Shorten’s office over which rumours in this place abound,” Senator Cash told the Senate hearing under parliamentary privilege on Wednesday. Michaelia Cash makes the comments she would later withdraw. Post continues. Labor’s Senate leader Penny Wong said the minister had made “outrageous slurs” against female staff working in the opposition leader’s office. “It can’t be allowed to stand. I think it is disgraceful and sexist and it is impugning of the character of various staff. I would ask the minister to withdraw,” Senator Wong told the hearing later. Senator Cash disagreed with Senator Wong, arguing she was responding to Senator Cameron maligning her staff. “The point I was making was rumours circulate in this building – it does not mean they are true,” Senator Cash said. After being asked to withdraw a second time, Senator Cash said: “If anyone has been offended by my remarks, I withdraw”. The initial threat came after Senator Cash angrily brushed off demands to name her new chief-of-staff, saying it would break with convention. This was a “dangerous path”, she said, although she was willing to go down it. Meanwhile, in US politics: Mia Freedman and Amelia Lester discuss the Florida school shooting, Mueller’s Russia indictments, and why a former Trump lover is threatening national security. Post continues. Senator Cameron said her “meltdown” had attacked young women in Mr Shorten’s office. He earlier told Senator Cash to settle down. “Take what the young people call a ‘chill pill’ and you might be OK,” he said. Labor has been pursuing Senator Cash over raids at Australian Workers Union offices last October. Details of the police raids were leaked to media by one of her advisers, who later quit. Mr Shorten’s office has been contacted for comment.